Info Robert Nelson Clement was born September 23, 1943, in Nashville, and began his political career at an early age. He was elected youth governor for Tennessee in the YMCA's Youth and Government program in 1962, graduating from Hillsboro High School the same year. Bob earned a B.S. degree from the University of Tennessee at Knoxville in 1967 and an M.B.A. from Memphis State University (now the University of Memphis) in 1968. He is married to the former Mary Carson of South Nashville. The couple has four children Greg, Jeff, Elizabeth and Rachel. The Clements attend Christ Church in Nashville. Their daughter Rachel is a graduate student at Vanderbilt University. Their daughter Elizabeth is married and living in Washington D.C. where she recently accepted a position with the Federal Bureau of Investigation. In 1969, Bob Clement joined the United States Army. When he was discharged two years later as a first lieutenant, he went directly into the Tennessee Army National Guard, where he served for 30 years, and retired with the rank of Colonel. 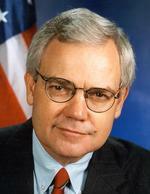 At age 29, Bob Clement became the youngest statewide office holder in Tennessee history. He won election to the Public Service Commission and served a six-year term, including two years as Chairman. In this job, he gained the reputation as a friend of the people, always fighting for Tennessee consumers. In January 1979, he formed Bob Clement and Associates, a successful marketing and management firm he operated until his appointment by President Jimmy Carter to fill a two-year term on the Tennessee Valley Authority Board of Directors. There he earned the reputation as a friend of the ratepayer, constantly fighting to keep utility bills low. From 1981-1983, he returned to the private sector where he was partner and owner of Charter Equities, a real estate investment firm. Bob Clement became President of Cumberland University on June 1, 1983, serving in that capacity until August 22, 1987, when he resigned to run for Congress. He is credited with moving the institution from a two-year college to a fully accredited four- year university. Clement was elected to fill the vacant 5th District seat in the U.S. House of Representatives in January 1988. During his eight terms in Congress, Clement served on the Transportation and Infrastructure Committee, where he was the ranking Democrat on the Railroad Subcommittee and a member of the Highways and Transit Subcommittee. Additionally, he served on the Budget Committee. Clement formed the Education Caucus in the U.S. Congress, where he served as co-chairman. He was also a member of the Exploited and Missing Children's Caucus, the Real Estate Caucus, the Travel and Tourism Caucus and the TVA Caucus. Congressman Clement amassed an impressive record of legislative accomplishments ranging from funding for regional mass transit, to national achievements in energy, transportation, consumer protection, and education. After an unsuccessful run for the United State Senate in 2002, Clement formed Bob Clement Consulting, a business and management consulting firm. Congressman Clement serves on the board of Nashville State Community College, and was recently awarded the Nashville Area Junior Chamber of Commerce Service and Leadership Award. The Nashville Area Junior Chamber of Commerce selected Congressman Clement for his long record of significant contributions to the city of Nashville.